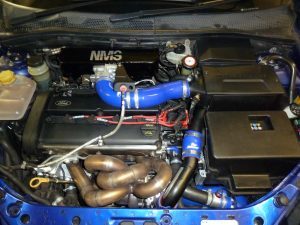 Replacing all the parts as in the 400bhp rebuild, this engine uses NMS designed H section Farndon con-rods and Mahle motorsport pistons machined to give an even lower compression ratio. The cylinder head is ported to the absolute maximum, giving a 26.5mm inlet port and 25mm exhaust port! Exhaust port exit opened up to circular 42mm exit to match large bore exhaust manifold. Tapered bronze valve guides are fitted (less restrictive than the fat nosed standard guides in the enlarged ports) 16 large valve seat inserts are fitted to the cylinder head to allow the use of 34mm inlet valves and 30mm inconel exhaust valves. Multi angle valve seats are maximised to give largest possible valve throat area! Cylinder head follower bores enlarged to allow use of Arrow solid lifter followers, allowing use of far more aggressive cam profiles. NMS solid lifter high lift cams with longer duration, and verniers fitted. Uprated valve springs and retainers are used and M12 conversion to block and head to ensure head is held down! 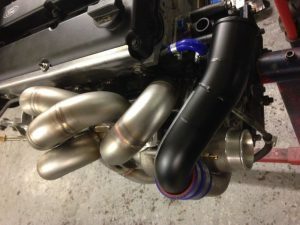 Inlet manifold replaced with our own centre entry large plenum, exhaust manifold with our specially made large bore, thick wall external wastegate manifold and Garrett HTA35 turbo with 3.5” downpipe, modified subframe to give a straight exhaust and 3.5” system. Maximum safe rpm of 7800rpm with std oil pump, or 8500rpm with dry sump system installed. Maximum power of 550bhp with wet sump system (rpm limited), 600bhp potential with drysump system and extra rpm available.